Injury or infection to a finger or fingers is a common problem. Infection can range from mild to potentially serious. Often, these infections start out small and are relatively easy to treat. Failure to properly treat these infections can result in permanent disability or loss of the finger. Early recognition and proper treatment of the following main finger infections will help prevent most of the serious outcomes. Paronychia: A paronychia is an infection of the finger that involves the tissue at the edges of the fingernail. This infection is usually superficial and localized to the soft tissue and skin around the fingernail. This is the most common bacterial infection seen in the hand. Cellulitis : This is a superficial infection of the skin and underlying tissue. It is usually on the surface and does not involve deeper structures of the hand or finger. Infectious flexor tenosynovitis: This infection involves the tendon sheaths responsible for flexing or closing the hand. This is also a type of deep space infection. Bacteria cause most of these finger infections. The exception to this is the herpetic whitlow, which is caused by a virus. How the infection starts and is found in a particular location is what makes each specific type of infection unique. Usually some form of trauma is the initial event. This may be a cut, animal bite, or puncture wound. Paronychia: The offending bacteria are usually staphylococcal and streptococcal organisms. Rarely, a fungus causes this infection, which usually begins as a hangnail. Often a person will attempt to bite off the piece of nail that is at the corner. This results in an open wound that allows the bacteria found on the skin and the bacteria found in the mouth to infect the wound. 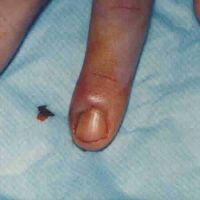 The infection can then spread to the surrounding tissue next to the nail and cuticle. Herpetic whitlow: The offending viral organism is the herpes simplex virus type I or II. This is the same virus that causes oral or genital herpes infections. People in certain occupations are more at risk for this infection. These include dentists, hygienists, physicians, nurses, or any other person who may have contact with saliva or body fluids that contain the virus. People with oral or genital herpes may also infect their own fingers. Cellulitis: The most common causes of this bacterial infection are staphylococcal and streptococcal organisms. This infection is usually the result of an open wound that allows the bacteria to infect the local skin and tissue. The infection can also spread to the hand and fingers by blood carrying the organisms. Deep space infection: This bacterial infection is usually the result of a puncture wound or deep cut that introduces the bacteria to the deep tissue. The collar button abscess is associated with the web space between the fingers. The deep structures of the hand create many potential compartments for an infection to invade. 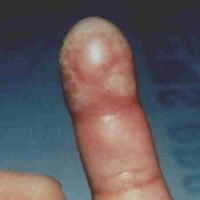 Each of the main finger infections has specific signs and symptoms that make identification unique and can sometimes cause confusion if not properly evaluated. Paronychia: The area next to the fingernail will appear red and swollen. A visible collection of pus may be seen under the skin and nail. This fluid may be actually leaking out of the wound. The area will be tender and painful to the touch. The drainage from the area is usually a cloudy white-yellow color. Felon: The fingertip is swollen and painful. The swelling usually develops over several days and is located in the pad area of the fingertip. The area will have a throbbing pain and be painful to the touch. The area is usually red, and a visible collection of pus may be seen under the skin. The swollen area may have a portion that feels soft as if it contains fluid. As the swelling continues, the area may become tense or hard to the touch. Herpetic whitlow: The fingertip area will be red and tender. A burning or itching sensation may be present in the area. There may be mild swelling, but not as extensive as in the felon. There may be a single or many open wounds in the area affected. These open wounds often occur in clusters after the formation of a small blisterlike lesion. The fluid in these lesions is usually clear in appearance but may be slightly cloudy. You may also have a low-grade fever and have swollen and tender lymph nodes in the area. Cellulitis: The area will be red and warm to the touch. The area may be slightly swollen and tender. This is usually a superficial infection, so the deep structures should not be involved. The motion of the fingers and hand should not be difficult or painful. If painful or difficult, this may indicate a deep space infection of some type. Infectious flexor tenosynovitis: Four major signs often are found with this condition. First is tenderness over the flexor or palm side of the finger. This pain is found over the tendons in the finger. Second is uniform swelling of the finger. Third is pain on extending or straightening of the finger. Fourth, the finger will be held in a slightly flexed or partially bent position. These signs are called Kanavel cardinal signs. All 4 signs may not be present at first or all at once. Deep space infections: The deep space infection that arises in the web space of the fingers is also called a collar button abscess. The space between the fingers will be painful and swollen. The area may also be red and warm to the touch. As the abscess becomes larger, the fingers will be slightly spread apart by the increasing pressure. The central area may have a soft spot that represents a collection of pus under the skin. The key to preventing disability and possible loss of the finger is early and appropriate treatment. If any signs and symptoms are present, you should contact your doctor at once. If you have signs or symptoms of a felon, cellulitis, infectious flexor tenosynovitis, or deep space infection, you should seek emergency care at once. How did the injury or infection start? When did this first occur or begin? Where did it occur? Home? Work? In water? In dirt? From an animal or human bite? Is it possible that a foreign body is in the wound? What have you done to care for this before seeing your doctor? Any previous injuries to the area? Any other medical problems that you may have not mentioned? Paronychia: A history of nail biting may aid the diagnosis. Felon: A history of a puncture wound or cut will aid the diagnosis. This would include a plant thorn. The doctor may obtain an x-ray to look for involvement of the bone or possible foreign body. Herpetic whitlow: A history of contact with body fluids that may contain the herpes virus will aid the diagnosis. The diagnosis can often be made from the history and the appearance of the lesions. The presence of a clear fluid from the wounds may indicate a viral infection rather than a bacterial infection. A sample of the fluid may be analyzed by a Tzank smear, which will identify certain cells, indicating a viral cause. Cellulitis: The doctor will need to consider other causes that may look similar such as gout, various rashes, insect sting, burns, or blood clot before the final diagnosis is made. An X-ray may be obtained to look for a foreign body or gas formation that would indicate a type of serious cellulitis. Infectious flexor tenosynovitis: A history of a puncture wound or cut will aid the diagnosis. The presence of the 4 Kanavel cardinal signs is a strong diagnostic aid. A recent sexually transmitted disease may indicate a type of gonorrhea-related infection, which may resemble infectious flexor tenosynovitis. Deep space infections: A history of puncture wound or other wound may aid the diagnosis. The finding of swelling between the fingers with a slow spreading of the involved fingers will help identify a collar button abscess. Because finger infections have the potential to become severe, home care is limited. A very minor paronychia may be managed at home if you have no other complicating medical illness, such as diabetes. All of the other infections require urgent evaluation and treatment by a doctor. Because delay in treatment may result in disability or loss of the finger, you should not hesitate to obtain medical care. A small, simple paronychia may respond to frequent warm water soaks and elevation of the hand. However, if no improvement is noticed in 1–2 days, you should see your doctor at once. The mainstay of treatment for finger infections is antibiotics and proper wound care. This can range from a simple incision and drainage of the wound to an extensive surgical exploration of the wound to remove as much infected material as possible. Some of the infections can be treated in a doctor's office or clinic, but several will require inpatient treatment and IV antibiotics. Because the organisms that cause these infections are similar, many of the same types of antibiotics may be used. Herpetic whitlow: Antiviral drugs such as acyclovir (Zovirax) may shorten the duration of illness. Pain medication is often needed. The wound must be properly protected to prevent a secondary bacterial infection and to prevent you from infecting other sites on your body or other people. Incision and drainage is not proper and, if done, may actually delay healing. Cellulitis: This infection is superficial, and oral antibiotics are usually sufficient. If the area is extensive or your immune system is weakened, then you may be treated in the hospital with IV antibiotics. Infectious flexor tenosynovitis: This is a surgical emergency and will require rapid treatment, hospital admission, and early treatment with IV antibiotics. Usually, the area will need to be surgically opened and all debris and infected material removed. Because of the intricate nature of the fingers and hands, a hand surgeon will usually perform this procedure. After surgery, several days of IV antibiotics will be required followed by a course of oral antibiotics. Deep space infections: Much like flexor infectious tenosynovitis, this can require emergency care. If the infection is mild, then only oral antibiotics may be needed. If more severe, a hand surgeon should evaluate the wound and IV antibiotics begun. Often these wounds will require incision and drainage followed by a course of antibiotics. You need to understand the doctor’s instructions completely and ask any questions you have in order to thoroughly understand your care at home. If you have been prescribed antibiotics for a finger infection, you must follow the directions and take them for the prescribed time period. Often, your doctor will instruct you to keep your hand elevated to prevent swelling. This is important and needs to be done both during the day and night. By placing pillows next to you while sleeping, your hand can remain elevated. Wound care will often need to be continued at home. This may include daily warm water soaks, dressing changes, and application of antibiotic ointment. The different types of wound care are extensive. Your doctor should explain in detail. The finger or hand may be placed in a splint. This provides both immobilization and protection. It will be important to follow the instructions regarding the care of the splint. You will need to protect and properly care for the splint. You should closely monitor the finger or hand to watch for complications such as swelling or infection under the splint. Often, you will be asked to return to the doctor’s office in 24-48 hours. This may be necessary to remove packing or change a dressing. It is very important that you have close follow-up care to monitor the progress or identify any further problems. If the infections are treated early and properly, the prognosis for full recovery is good. However, if treatment is delayed, or if the infection is severe, the prognosis is not as good. With the infections that involve deep structures such as infectious flexor tenosynovitis, even with the best care, the outcome may be less than desirable. Loss of function, loss of sensation, disfigurement, or even loss of the finger is possible. Your doctor will need to evaluate each case individually and present the likely outcome based on the findings. 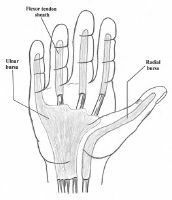 Media file 1: Flexor tendon sheaths and radial and ulnar bursae. Image courtesy of Randle L Likes, DO. Media file 2: A herpetic whitlow. Image courtesy of Glen Vaughn, MD. 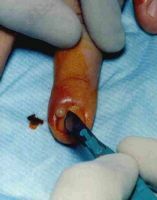 Media file 3: A moderate paronychia. Swelling and redness around the edge of the nail is caused by a large pus collection under the skin. Image courtesy of Christina L Kukula, DO. Media file 4: Drainage of pus from a paronychia. Image courtesy of Glen Vaughn, MD. Media file 5: A paronychia can progress to a felon if left untreated. Image courtesy of A paronychia can progress to a felon if left untreated. Image courtesy of Glen Vaughn, MD. Media file 6: Anatomy of the fingernail. Top - The normal fingernail. 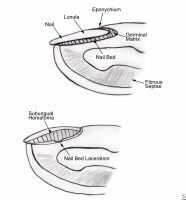 Bottom - Nail bed laceration with subungual hematoma.